The FCC’s new Open Internet rules seek to limit interference by broadband service providers in markets for Internet-based content and applications. But to do so, the rules may significantly reduce the amount of innovation possible in the broadband service market. An aggressive interpretation of the rules suggests that broadband providers are generally required to offer customers access to all lawful Internet traffic, or none at all. 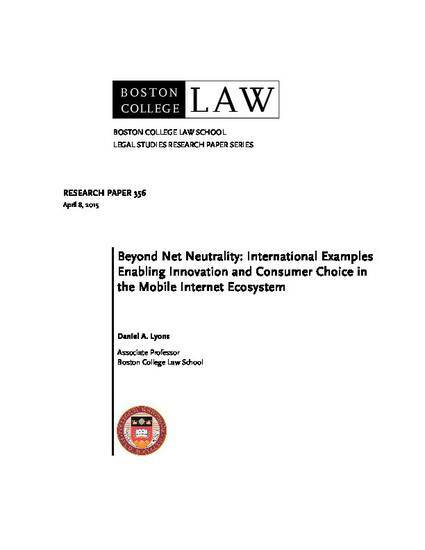 This paper explores the way in which this all-or-nothing homogenization of the American broadband product differs from innovative non-net-neutral practices that are taking root in other countries, particularly in mobile markets. Around the world, companies are offering consumers alternatives to traditional broadband access, including zero-rated or premium content, sponsored data, and social media plans, which can benefit consumers and enhance competition in both broadband and edge markets. As the FCC fleshes out its new standard for regulating broadband business practices, it should be careful that its rules do not preclude Americans from sharing in the global revolution currently taking place in telecommunications.